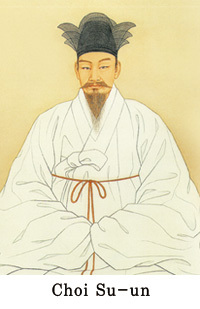 His original name was Choe Je-u (최제우 崔濟愚.1824–1864). He founded Eastern Learning (Donghak, 동학 東學), a popular religious and social movement of nineteenth-century Korea. He proclaimed the coming of the Later Heaven Gaebyeok and that Sangjenim would one day advent in Korea. Su-un (“Water Cloud”) was his honorific name.